Disclaimer: Thank you to Pink Blush Boutique for sending select styles for this post. All opinions are my own. Visit my disclaimer page for more information. Unfortunately, pregnancy often means buying a whole new wardrobe. One day, you’ll wake up and nothing will fit you. Your old body will be a thing of the past and it’s time to embrace the bump! This isn’t my first rodeo, so luckily I had a lot of maternity clothes packed away that I could dip into. However, I really wanted some new nice things to help me feel pretty and confident during this pregnancy. 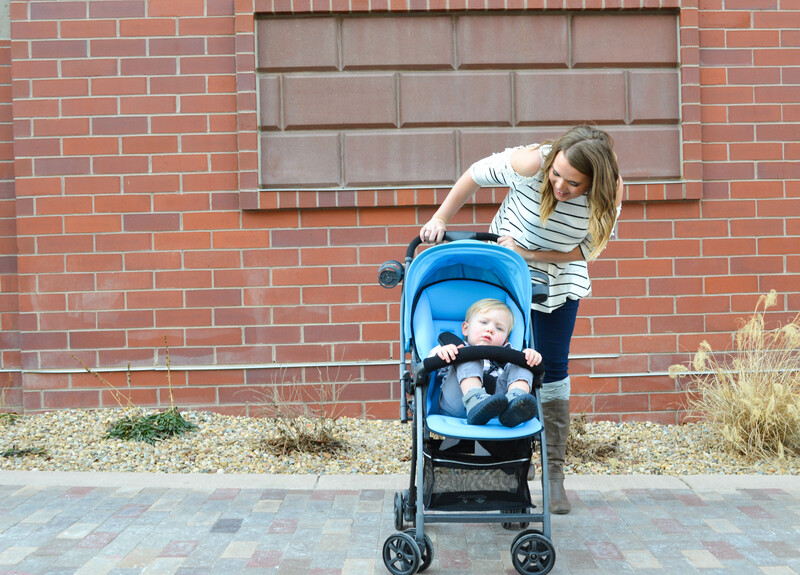 During my last pregnancy, one of my favorite places to shop was Pink Blush Boutique. They have such cute maternity clothes! 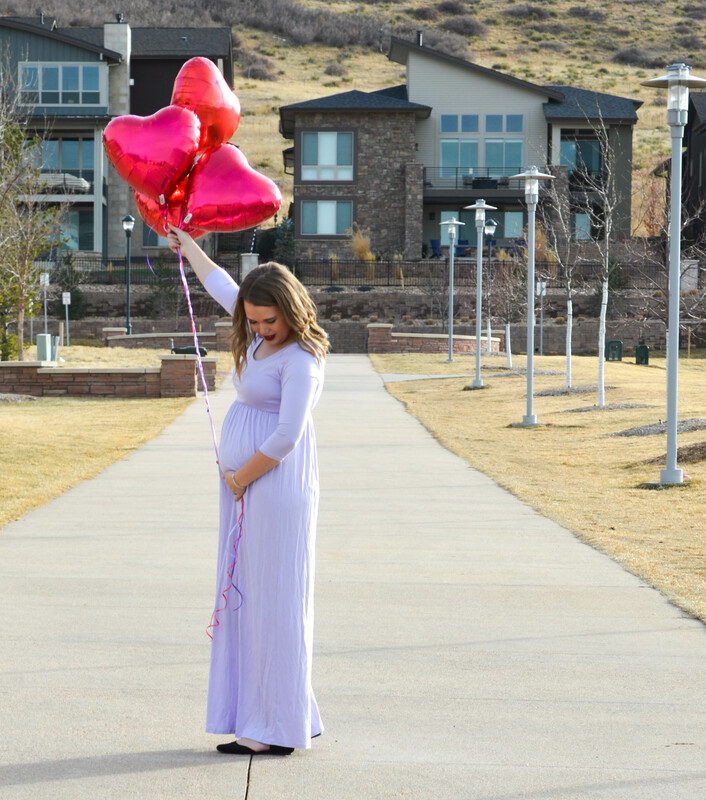 Pink Blush Boutique offers clothing for every stage of motherhood. Maternity, delivery robes, nursing, and postpartum. 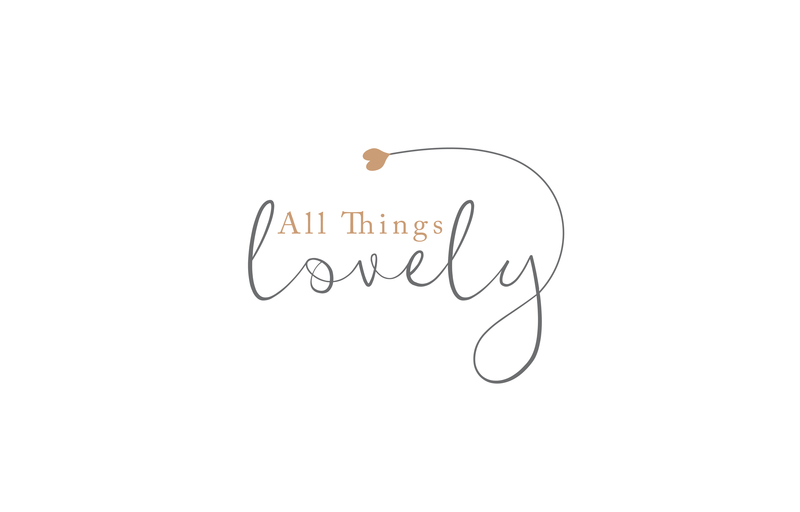 Their women’s line is awesome and I shop from there all the time when I’m not pregnant (Check out last years Fall Style with Pink Blush here). I love that they have something for no matter what stage of life I’m in. 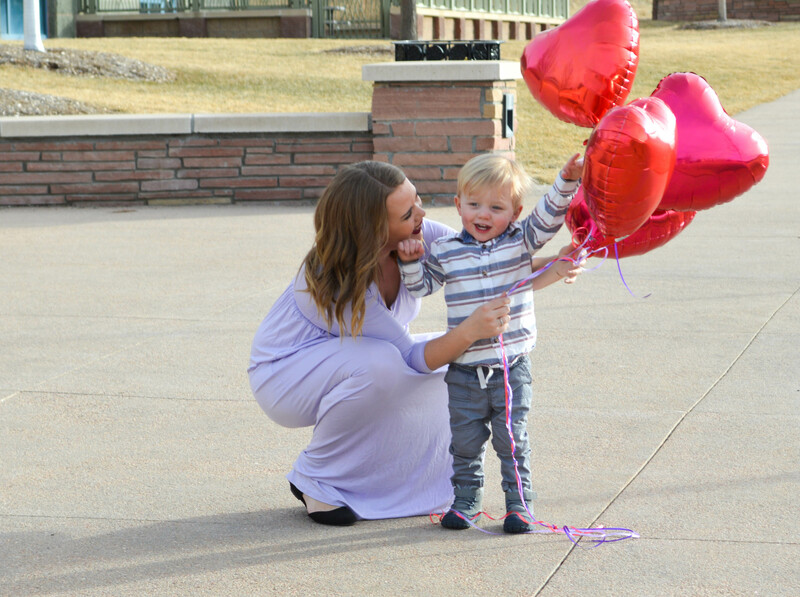 My bridesmaid’s dress from my sister’s wedding (almost 2 years ago now), and my baby shower dress from my pregnancy with Sawyer were even Pink Blush. Both my best friend and my brother are getting married this year so I wanted some nice things to wear to all the showers, parties, and rehearsal dinners I have coming up. 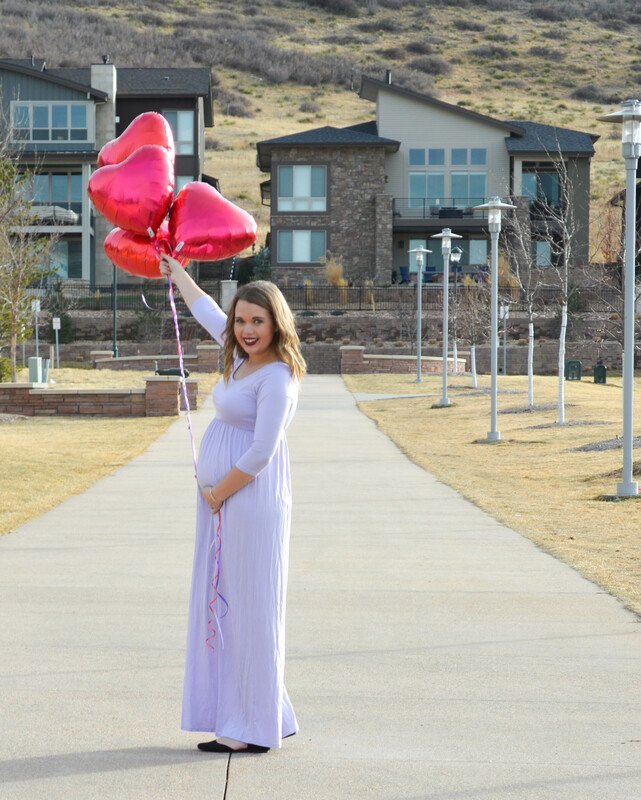 I got 2 really pretty maternity dresses from Pink Blush. This lavender dress is my favorite out of all the pieces I got this round. I think the color really compliments my skin tone, and is so great for spring. I feel so pretty in this maternity dress! And it’s so comfy. It would be a great dress for an Easter brunch! This darker dress was really elegant. Perfect for a rehearsal dinner or date night with my man. I really liked the length and that I could pair it with heels or flats. I also wanted at least one more casual top I could pair with jeans or leggings and this cold shoulder top was perfect! 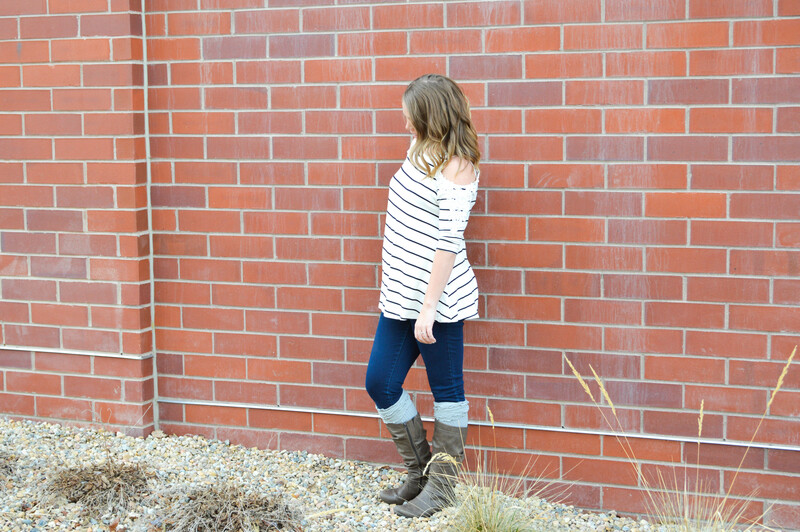 The cold shoulder trend was so in this past year and I loved it. It’s flowy enough that I can still hide my bump when I want to (at this point anyway- maybe not a few weeks from now), or I can pull it in and show it off! I love the stipes and the lace details on the shoulders.